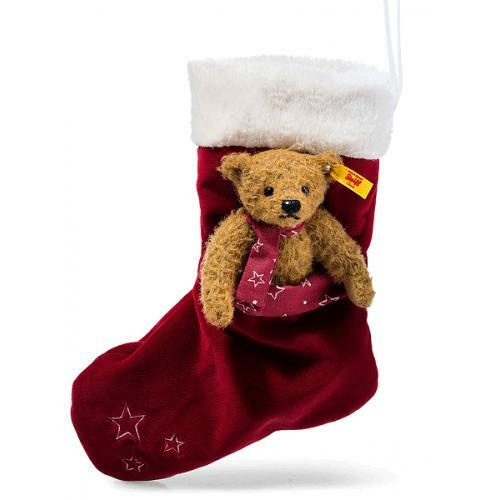 Teddy Bear With Christmas Stocking is from the Steiff Classic collection and Teddy is hand made in beautiful russett mohair and wears the famous Button in Ear and yellow tag. Teddy Bear is removal from the, front pocket on the Christmas stocking. This velvety soft plush stocking can be used to add yet more surprises inside! 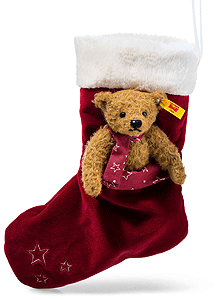 The Teddy bear in the Christmas stocking makes a truly charming Christmas gift. The bear has a height of 15 cm and is made of the finest mohair. The Christmas stocking has a loop for hanging and the inside is decorated with a lovely star pattern. The Christmas stocking can be filled with all kinds of small gifts and is an excellent ornament for the Christmas tree. The bear can be taken out of his stocking, but the scarf that the little guy is wearing cannot be removed. A delightful gift idea that no Christmas tree is complete without.